These four pieces will be available for purchase for $50 each at the 2018 Friends $50 5×7 Art Works! Exhibition and Sale. All proceeds go to support the Friends of Leesburg Public Arts. Art Lovers! This is an incredible opportunity to purchase a unique and lasting Mother’s Day gift! Friends of Leesburg Public Arts and Tryst Gallery are pleased to invite you to the Third Annual $50 Friends 5×7 ArtWorks! Exhibition and Sale this weekend! All proceeds benefit public art projects within the Town of Leesburg. 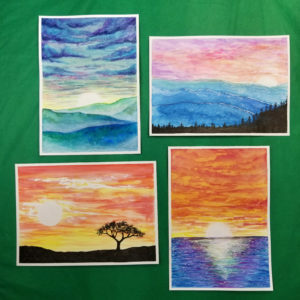 Every original painting or 3-D piece sells for $50. Art Sale and Meet The Artists: Friday, April 27th, 6 – 9 pm. Going Going Gone Sale Saturday: April 28th 10 am – 4 pm.